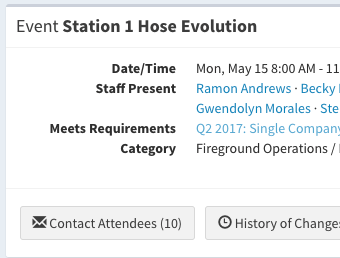 Rescue Hub makes it easy to communicate with your staff about any of your training-related needs. Send a message to anyone who hasn’t completed a training requirement. Contact all personnel who are attending an upcoming drill. Email an entire shift about a new piece of equipment. Send a message to all personnel in a specialty area (like all paramedics, rescue technicians, or HazMat responders). The Rescue Hub messaging system won’t replace your existing email system, but it has some nice features that you don’t get with other email systems. When a message is sent through the Rescue Hub system, your staff can see it when they login to Rescue Hub. They also get a copy in their email inbox, and can reply to it like any other email they get. 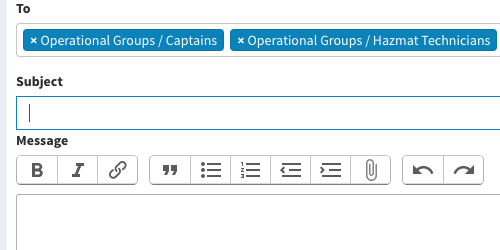 Rescue Hub messages and replies are saved in the system, so your personnel can always refer back to it later. You can send big file attachments through Rescue Hub. If you have a large PowerPoint file that gets blocked through your normal email system, use Rescue Hub to send it wherever it needs to go within your department. We store the file on our servers, and recipients can click the link in the message to access the file. You can record a short video with your phone, and attach it directly to the message. We host the video on our servers, and ensure that it can be viewed on any computer, laptop, tablet, or mobile phone.